While doomsday prophesies on the 2012 phenomenon are churned out as bestsellers and blockbuster action-adventure movies, a pyramid in Bengaluru suburbs is now being positioned as the epicentre for ultimate redemption: transformation of human consciousness through meditation! The Maitreya-Buddha Pyramid, a New-Age temple of spiritual awakening built amidst the granite-rich hillocks of a sleepy village, Kebbedoddi, about 30 kilometres south of Bengaluru City on Kanakapura Road, is hallowed as the world’s largest pyramid dedicated solely to practising intensive meditation. 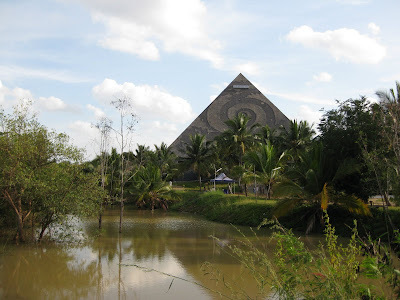 The Pyramid Spiritual Societies Movement has pledged to make the 40-acre lush Pyramid Valley at Kebbedoddi an international centre for filling the whole world with “cosmic energy and soul power” of the Pyramid Masters by the year 2012. Constructed on the principles of the Great Pyramid of Gizeh and perfectly aligned to the four cardinal points – North, East, South and West, the Maitreya-Buddha Pyramid is as tall as a ten-strorey building at 102ft. With a base area of 160ft x 160ft, it can accommodate 5,000 people. A spiral Kings Chamber, the most energetic spot of the pyramid, stands 34ft tall at the centre. The pyramid has the golden angle of inclination at 51 degrees 52 minutes on all sides. Over 640 natural Himalayan crystals are fitted inside the hall to amplify the pyramid energy and enhance the profound meditation experience. The exterior surface of the pyramid is covered by beautiful murals depicting various elements of nature. The lower hall of the pyramid has exquisite murals and art work of Buddha, evoking the spirit of powerful meditation techniques that Buddha identified. Brahmarshi Patriji, an enlightened Master who embraces positive elements from a wide variety of spiritual sources, is spearheading the Pyramid Meditation movement with his avowed aim of creating “Dhyana Jagat” (Meditative World) by the year 2012. Subhash Patri, a soil scientist who was a sales promotion officer with the Coromandal Fertilisers in Andhra Pradesh, was first fascinated by the book ‘The Secret Power of Pyramids’ by Bill Schul and Ed Pettit. “I built a miniature pyramid and conducted some practical tests. Tomatoes and brinjal kept inside the pyramid remained fresh for almost a month, while those left outside shrank and dried within three days. Even razor blades turned out much sharper just by being inside the pyramid,” says Patriji, who is married and has two daughters. He built his first pyramid for meditation at Kurnool in Andhra Pradesh. Today, thousands of Pyramid Masters are immersed in spreading his unique science of Anapanasati Meditation, which is easily accessible to the rural masses as well as the urban elite. Anapanasati, in Pali language, means “to keep one’s total attention and awareness only on one’s normal breathing process.” In Anapanasati, attention of the mind should constantly be on the breath. “Be with the breath energy” is the only instruction given. No mantra is to be chanted; no deity to be worshiped; no ritual to follow. Just be with the natural rhythm of the breath. Meditation done inside a pyramid, says Patriji, is thrice more powerful. Preservation, healing and out-of-body experiences are attributed to Pyramid Powers. Most people experience feelings ranging from utter calmness to extreme euphoria while meditating inside a pyramid.